"For I know that I am fearfully and wonderfully made in You...You make it Beautiful Somehow"
Welcome to our playhouse! 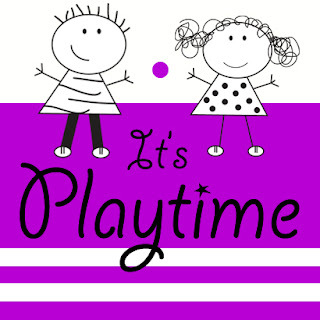 Come on in and have some fun! 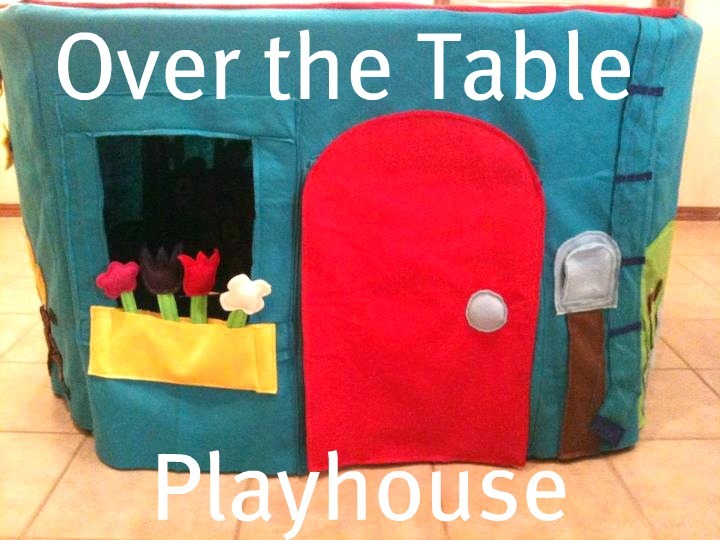 I first saw the idea for an over the table play house on Homemade by Jill. 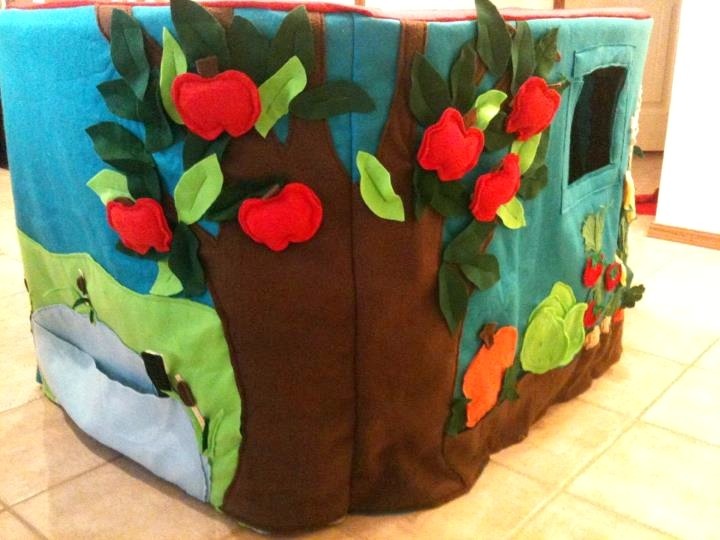 She made an amazing playhouse for her son's birthday. I was completely in love with the idea! It took me quite a while to get around to doing the project, but once I started I had so much fun making it! Above is our front door. Simply flip the door up and come on in! This makes it easy for little ones to crawl in and out. A reader on Homemade by Jill suggested adding velcro Christmas lights during December. I will definitely be doing this! At the window box you can pick pretty flowers. They even smell! I simply spayed them with some flowery scented body spray. The smell has started to wear off, so I may add some dried lavender or something to the inside. 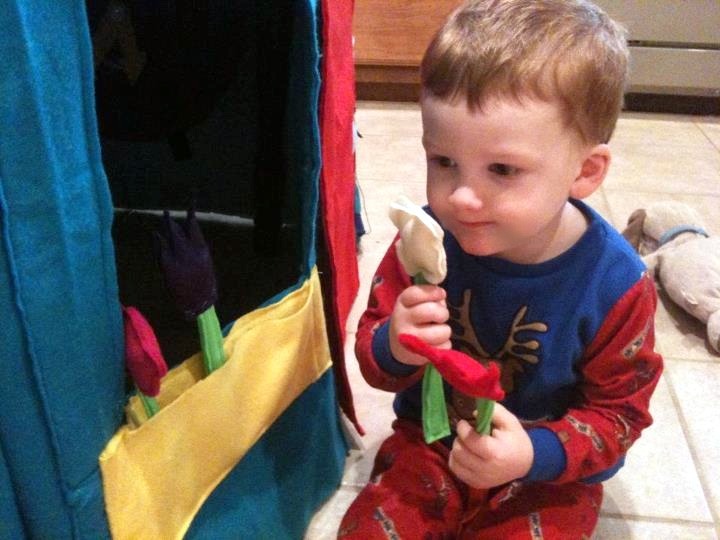 Jack loves smelling them! 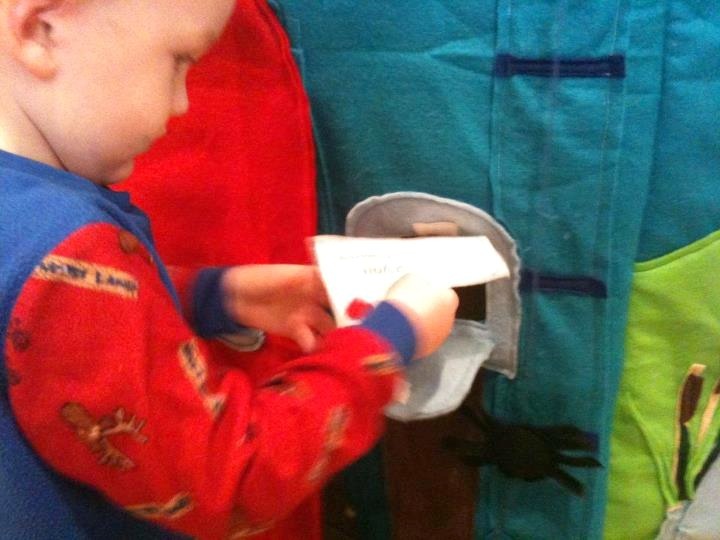 We have our own mail box and even an Itsy Bitsy Spider! They even have a heart postage stamp. 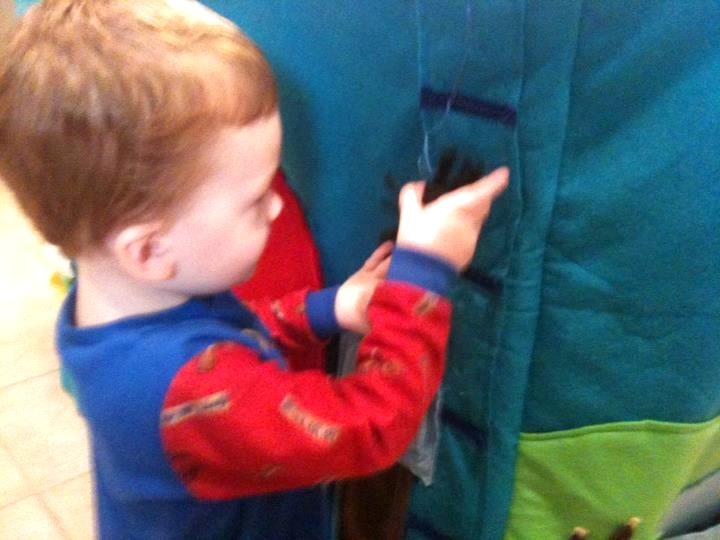 The Itsy Bitsy spider is a huge favorite! This was the last thing I added to the house before assembling it. Jack loves to sing. Currently his favorite song is the Itsy Bitsy spider. I thought it only fitting to add one to his house. 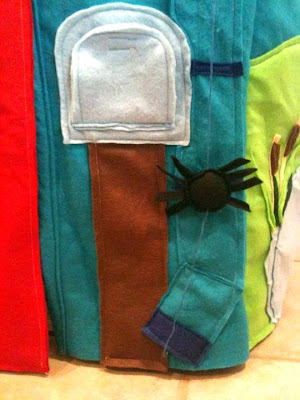 The little spider slides up and down a string and can even hide inside the bottom of the spout! Of course, he always sings the song when he plays with his spider. I love this little guy! Time to go fishing! Our little pond is complete with cattails and rainbow fish. In the future I plan to add some velcro fireflies to the top that Jack can move around. It took a bit of thinking to figure out how I wanted to do the fishing rod and fish. I wanted Jack to actually be able to catch the fish on his line. I originally thought of metal sewed into the fish and a magnet on the end of the fishing line. Luke however, is still in the 'put everything, everywhere, in my mouth' stage. 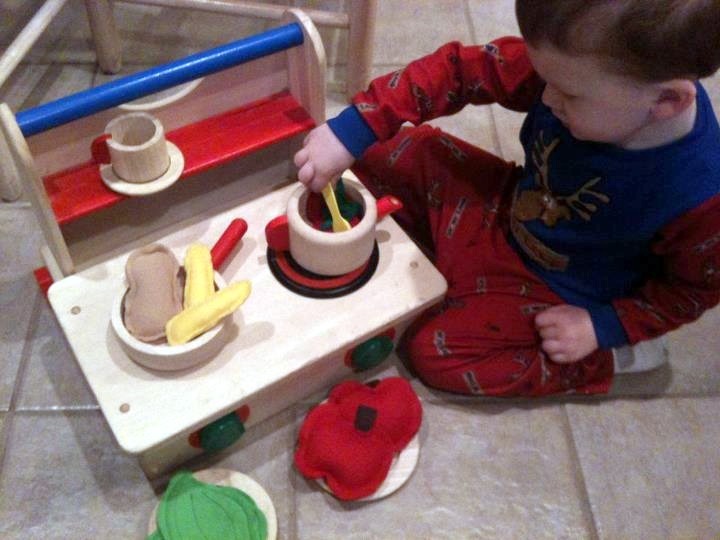 I was afraid he would pull the magnet off the line and choke or ingest it. Not good. Instead, I made the fish out of felt and stuffed them, added some velcro to the end of the fishing line and presto...time to fish! It is not the easiest method, since the velcro also grabs the sides of the pond. The really positive thing about it, is the concentration it takes to actually catch a fish. 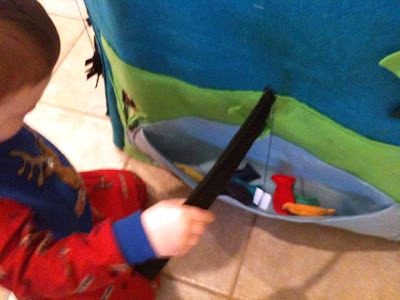 It also really helps with hand-eye coordination skills! This is our apple tree. You can pick the apples! Other blogs suggest making different kinds of fruit so you can switch it out periodically. I would love to add some lemons! 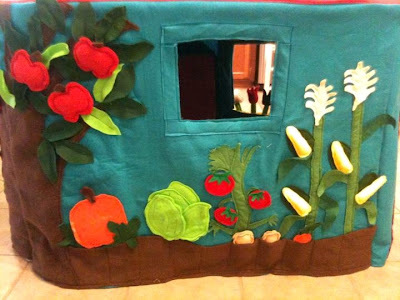 You can harvest all of the vegetables! We have corn, carrots, potatoes, tomatoes, lettuce, and a giant pumpkin. 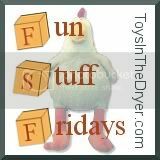 During Halloween, I am going to make some felt shapes the kids can add to the pumpkin to make a jack-o-lantern! After a long day of harvesting it is time to cook up all that good food! Time for a camp out! Build a fire, roast some marshmallows, and stare up at the stars! 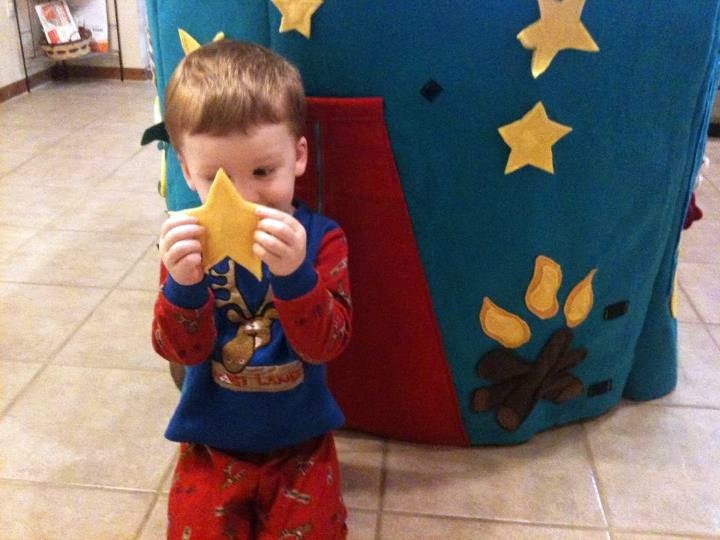 Each of the stars is attached with velco so Jack can move them around! There is also a stick with marshmallows (didn't make it into the picture somehow) to roast over the campfire! 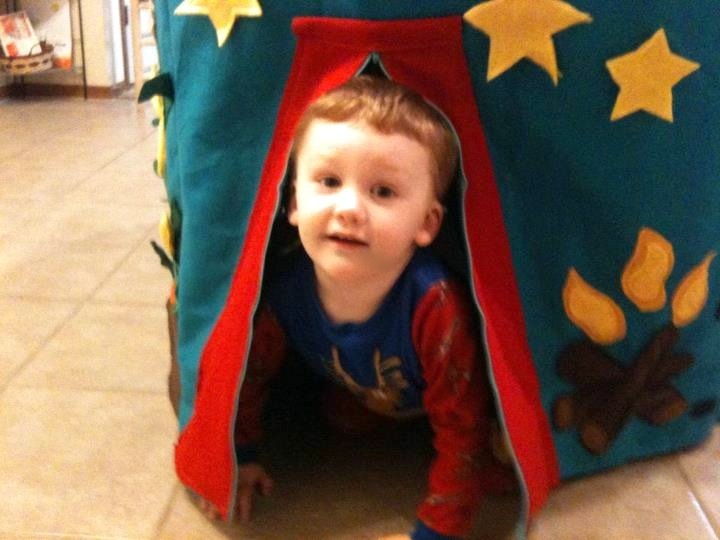 Oh, and it is also a secret entrance into our playhouse! It zips up and down, which is great practice for little fingers! Come on inside and take a look! I wanted every inch of our play house to be interactive, encourage imaginative play, and be used as a teaching tool. Because of this I even add things to the walls inside! First is our ABC "chalkboard" wall. 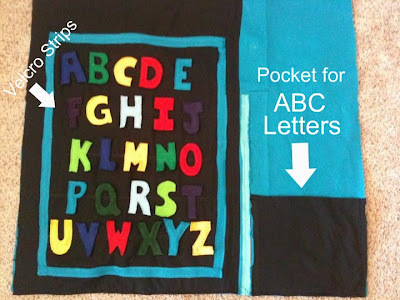 Each letter is made of two pieces of felt that are sewn together to make them sturdier. Take them out of the storage pocket and arrange them on the chalkboard. 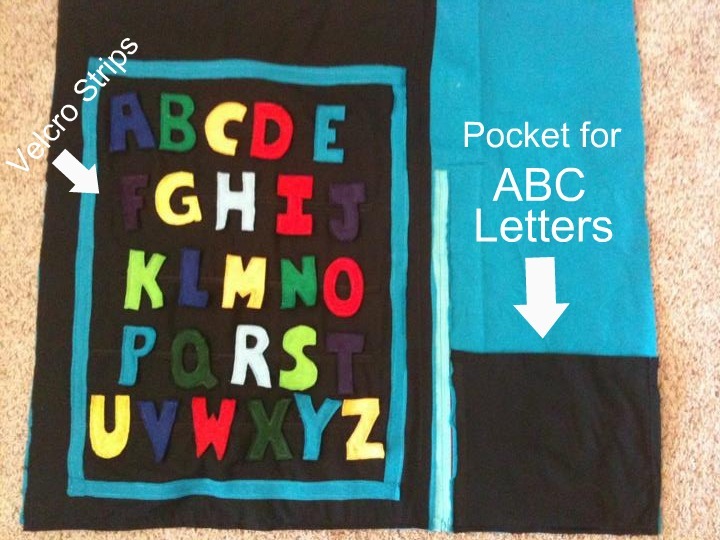 Five strips of velcro help hold the letters in place. As Jack gets older I will add more letters so we can begin to spell out words. Our clock was "created" by Jack. 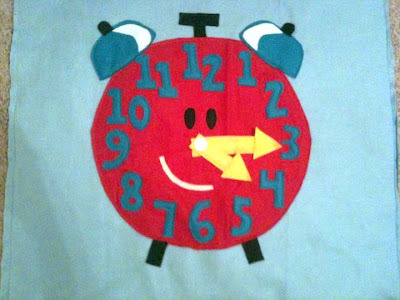 When I started making this clock is was a plain circle with numbers and hands. When Jack saw it he said "oh momma, tickety tock!" He was of course referring to Tickety Tock off of Blue Clues. Awesome idea Jack! I added a few more details and we now have our own Tickety Tock. The hands are attached with a button so they can be moved to practice telling time. 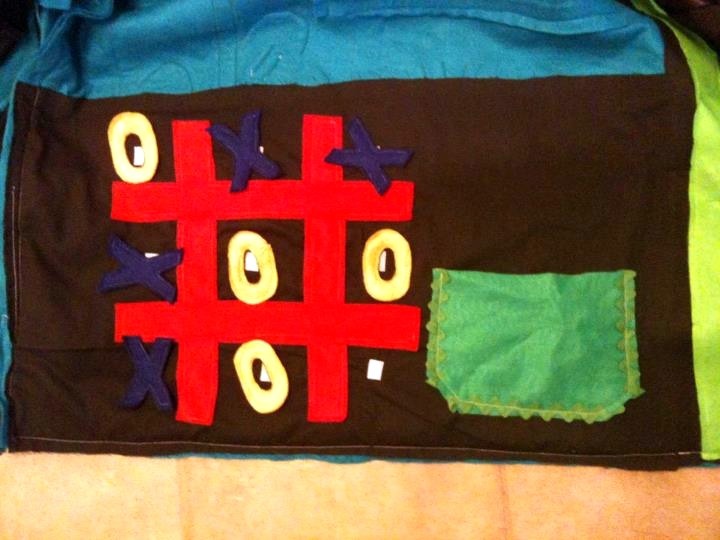 I added a tic tac toe game. Jack doesn't completely get how you play the game, but he is learning! We can even practice counting on our abacus. 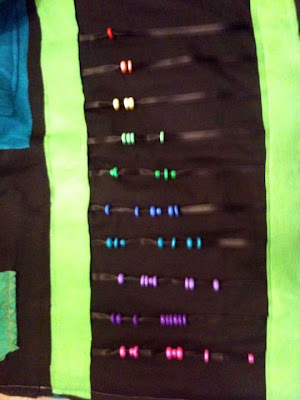 The beads slide easily across the ribbon to count them one by one. We also use this to practice some of our colors. Child learn through play. That was one of my big motivations for making this house. I wanted something that would encourage my children's imagination and help them learn in the process. We play for hours in our playhouse. The options are almost endless! It is the perfect thing for a rainy or cold day when you can't be outside. This project was so much fun to make! I loved coming up with ideas for it. Making it was actually easier than I thought it would be. It took me about two weeks to come up with the ideas, cut it all out, and sew it all together. I made ours to fit perfectly over our kitchen table. I loved this idea since it wouldn't take up any extra space to set up a card table or make a frame for it. However, if you have some extra space to keep it set up all the time, a card table or a pvc frame would be perfect. -Sew on all of the details first. Then assemble. It was hard enough to maneuver one big piece of felt on my sewing machine, I can't imagine how hard it would be with all the side intact already! -Use felt for the base and details. It is easy to cut out, sew, and you don't have to finish any of the edges. -Make plans for at least two windows. Otherwise it becomes pretty stuffy and dark in there! Two windows will allow for airflow and light...much more pleasant. -Consider putting some type of mesh on the windows. Little ones will try to crawl or jump through the windows. Homemade by Jill warned me of this but I didn't listen. Wishing now I would have done this! -Shop around for your supplies. One of the reasons I put off doing this project for so long, was the amount of material the base requires. Use coupons and shop around for the best sale price. I waited and found a ton of the blue and red felt at the thrift store for only a few dollars!!!!! What a steal! Here are some additional resources with tips on making your own Playhouse! -Homemade by Jill has several posts on her playhouse, and even templates! Find them here. -Sew Much Ado has a fun and easy tutorial on their boy's playhouse. Find it here. -I love this sweet little playhouse from Nap Time Crafters! Perfect for little girls! I love the inside...especially the book shelf idea! Actually, I love it all! -Sew Like My Mom made a playhouse to go over a pvc frame! Find it here. 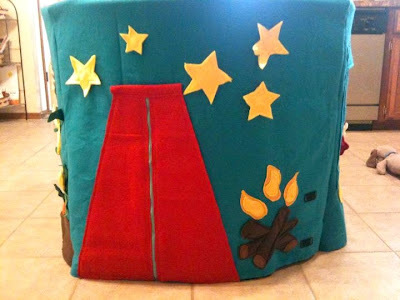 -You can also find tons of inspiration on this card table playhouse Pinterest board. -Of course if the idea of making one of your own is out of the question you can buy them from Miss Pretty Pretty on Etsy! 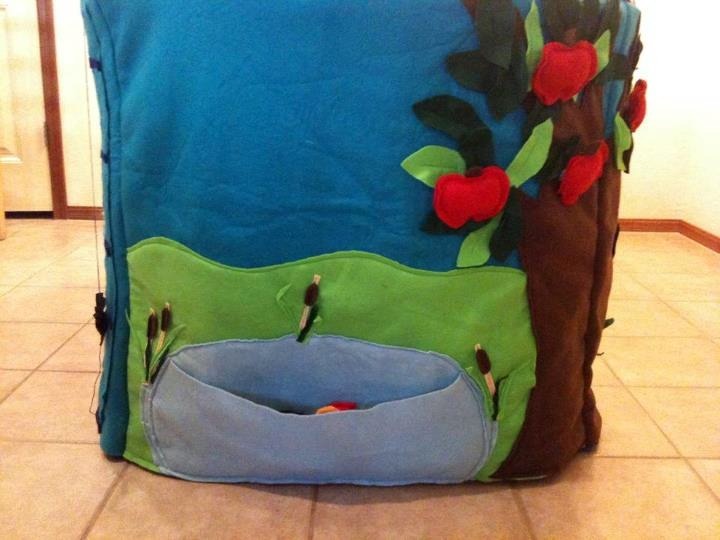 Her playhouses are gorgeous and she has tons of themes to choose from! Find her shop here! Wow, this turned out fantastic! You must be so thrilled. Your little one looks like he really enjoys all the interactive features. Thanks for sharing. Thanks Happyscrapper42! I had so much fun making it! Thanks Marnie! And thanks for hosting the weekly kids Co-op. I get so many wonderful ideas from there! WOW!! This is amazing!! 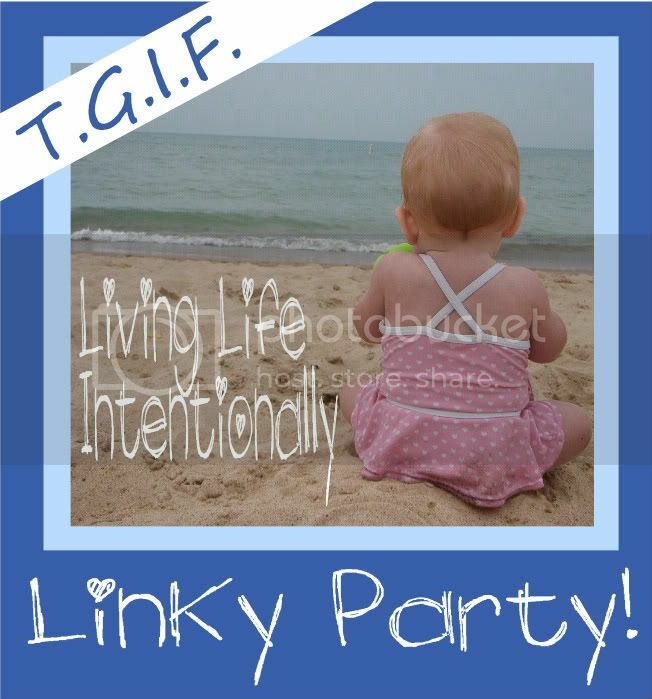 I so want one =-) I am featuring this at TGIF this week - http://www.livinglifeintentionally.blogspot.com/2012/04/tgif-linky-party-25.html - Feel free to grab an I was featured button! Thanks for linking up & I can't wait to see what you link up this week! This is totally amazing! I love the idea of incorporating the table. 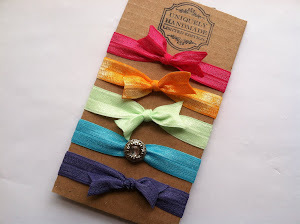 I'd love to make one...someday! Thanks Anna! I have to say your site is totally amazing! I have gotten a lot of wonderful inspiration from it! WOW! This is so awesome! We made an over the table playhouse also: http://letkidscreate.blogspot.com/2011/07/make-your-own-playhouse.html It doesn't even come close to being as fabulous as yours. My kids crawl through our windows too, and since ours was made from muslin it tore pretty easy. Thanks Brooke! I LOVE your idea of letting them color and decorate it themselves! So fun! sew cool! If I made it it would have to be with a glue gun. Sewing that would just take too long and I would give up before it was done. Cudos to you for all of your hard work. Thanks Jenifer! It did take a lot of work, but it was so much fun to create! Welcome to Beautiful Somehow! I love to blog about family and faith, motherhood and homemaking, frugal and healthy living, and homeschooling. Learn more about our family on my About Me page! Family Worship -Leading your little ones to God.